Italian sports betting giant Scommettendo.it will soon be offering online casino games from iSoftBet to Italian players. All of iSoftBet’s regulated casino games including Platoon and Beverly Hills 90210 will soon be making their way to the Scommettendo web site. Games ranging from iSoftBet’s premier original and branded slot machines all the way through to deluxe video poker games and roulette tables are now being installed. Scommettendo has proven to be a key player in the Italian market, and has been providing players with state-of-the-art live sports betting, casino and bingo services for over a decade. iSoftBet Sales Manager Luci Apostolou said the company’s newest partnership represents an incredible opportunity for iSoftBet. Beverly Hills 90210 brings the ’90s hit TV series straight into the 21st century in this fun-filled slot machine. Players can relive the drama and excitement of California in the ’90s as the gang gets back together to bring players a unique and engaging online gaming experience. Featuring all of the show’s best loved characters, Beverly Hills 90210 slot game comes with an incredible 243 ways to win big on the reels and a never-before-seen Transformer symbol to boost players’ winning chances! 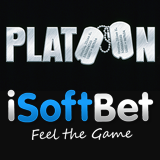 Platoon is an explosive slot machine, based on the classic ‘86 war film. It brings all the action of the Academy Award winning film back to life with stunning audio-visual effects, a unique design and hundreds of chances to win. “We’ve got plenty more original, branded and mobile content in the pipeline, and we’re excited by the prospect of continuing to share our fantastic products with Scommettendo for years to come,” said Luci Apostolou at iSoftbet.